As a general contractor, your ability to calculate your overhead and profit margin are what can make or break your business. It can seem difficult to know how much to charge as a contractor, but understanding typical contractor overhead and profit, can help make it it clearer how you should price your jobs. Every business has regular expenses that are not directly related to specific construction jobs. This is your business overhead and it is the expenses that come with keeping your business open. These are expenses such as office expenses, bills, bookkeeping, accounting, taxes, legal costs, your insurance for independent contractors, tools and equipment, trucks, and more. All of your overhead expenses need to be taken into account when working out how much to charge as an independent contractor. Your profits on a job are what’s left from what you were paid, after you’ve subtracted your overhead and the “hard costs” of the job. The hard costs include labor, material, supplies, and more. To make it easier to understand, we’ve included some examples of this below. You need to have a clear understanding of the job costs and your overhead to know how to price jobs as a contractor. When you’re preparing a bid, you need to take these costs into account and adjust your profit margin accordingly. 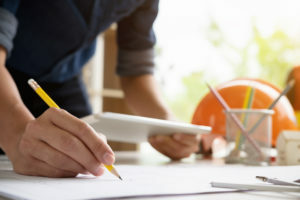 How much should a general contractor charge? Overhead and profit margin are the main considerations. In order to figure out how to make money as a general contractor, you need to understand how to calculate general contractor profit margin. You also need to understand how to write up your bid (the amount the homeowner will pay for the job) so that you’ll make a profit after you’ve paid your overhead and your job costs. Make sure to keep in mind that your profits do not automatically include your salary as the business owner. Ideally, your salary should be included as part of your overhead expenses. Profit is money that belongs to the company, to be reinvested for business growth. Your minimum profits objective should be around 8 percent. 10 percent is average, and 15 percent is ideal. For our example, we will work with 10 percent theoretical profit. Let’s say that your revenue for a job will be $500,000. That’s the amount you bid, and the customer agreed to pay. That’s your revenue. If your overhead costs are $100,000, and the job costs you $350,000 to complete, you’ll be right on track. $500,000 revenue-$100,000 overhead is $400,000 for job costs and profit. $400,000 job cost and profit minus $350,000 for job cost leaves you with a profit of $50,000, which is 10 percent of your revenue. This is all a bit complicated, and you’ll want to go over your numbers more than once to understand your overhead and profit margin, and make sure that you’re on track for making the money you want. So, how much should contractors charge? First, we need to ask what is the average profit margin for a general contractor? It is important to be aware of industry standards before you work out your pricing. Just as important is understanding your own business costs (overhead) and this varies from business to business. In the construction services industry, gross margin has averaged 17.18-18.69 percent over 2018. However, suggested margins can be as high as 42% for remodeling, 34% for specialty work, and 25% for new home construction. In terms of average wage per hour, this depends on your profession with carpenters earning an average of $21/hour, electricians earning an average of $26/hour and other professionals earnings varying widely. This varies from state to state, however, and the more important consideration when it comes to setting prices is your overheads and profits. It’s a better business practice to quote per project than per hour. Doing so allows you to work out your overhead and profit margin, as well as markup, to ensure your business remains profitable. It’s always a good idea to raise your prices before you are desperate. For example, if you wait until after you’ve hired an employee to raise your prices, your business will be under a lot of financial pressure while your clients adjust to the new payment schedule. Instead, try to plan in advance and give your customers warning about your growth plans. By planning ahead, you can raise your rates in a measured and incremental way. Some customers will not be able to afford the new fees or may look for a bargain elsewhere and that’s ok. Explain the benefits of your growing business to your customers. Work on strengthening your relationships with your current customers at the same time as you increase your rates so they will value your business enough to stay. Follow small business bookkeeping tips to stay on top of your expenses so you can create a clear strategy for pricing jobs. This will help your business remain profitable.